Syngency uses the concept of a "booking status" to indicate at which stage in the billing cycle a booking is. Not to be confused with the individual schedule types of the talent within the booking, the status is specific to the booking overall. 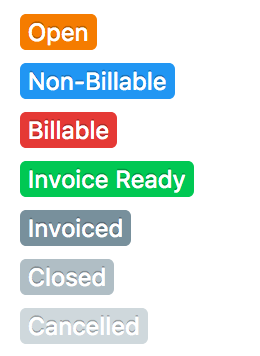 However, you will notice that the colours of the Open, Non-Billable, and Billable statuses, correspond with the same colours used for Option, Casting, and Confirmed schedule types. The booking is tentative ("pencilled-in"), or isn't yet confirmed by the client. The booking is confirmed, but won't be invoiced. Generally used for castings or test shoots. The booking is confirmed, and will be invoiced upon completion. The booking has been completed, and is ready to be invoiced. An invoice has been created, and sent to the client for payment. If you are using our Xero or QuickBooks integration, changing a booking status to Invoiced will also create the invoice in Xero or QuickBooks. The client has made payment, talent have been paid, and the billing process is complete.